Leyland Olympians came first to London Country in 1982, when LCBS took over the rather rural 'red' route 84 (New Barnet Stn. to St.Albans) from London Transport. Subsequent batches arrived annually. The first vehicles LR1-30 and LR31-50 were bodied by Roe, but subsequently LR51-75 were bodied by ECW after the closure of the Roe works at Leeds in 1984. 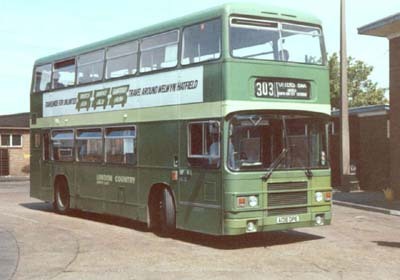 Most remarkable were the coach-seated vehicles LRC1-15 which operated for Green Line on fast commuter services into London from Kent, and on some airport sevices. Subsequent LR class vehicles were bought by London Country North West and numbered sequentially. 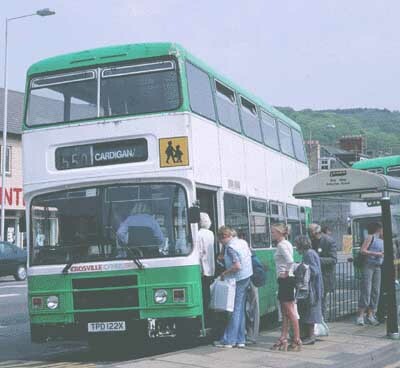 The Olympian was born as the Leyland B45, and was the sister of the integral-bodied B15 London Transport Titan, initially built at Park Royal, London and subsequently entirely at Workington. Sales of the Titan were very few outside the capital, and it was decided to make a new chassis that could be exported for body-building in a number of optional lengths. The clever feature of the chassis was its construction in front(axle & steering), rear (engine & transmission) and variable-length middle sections. Thus the length could be modified without affecting the rest of the chassis. Ultimately a 12 metre, three axle configuration was developed and sold to Hong Kong and Singapore in quantity. BUSES Magazine reports that KOWLOON MOTOR BUS took take delivery of 49 more VOLVO Super (10.6m) Olympians built at the Wroclaw, Poland plant. Production of all remaining lines will cease at Irvine in July 2000. And remember - A B7L is really only a re-engineered Olympian ! It came as quite a suprise when I encountered TPD122X during a family holiday in South-West Wales over Easter 2000. I did not know that five ex London Country Olympians were owned by Crosville Cymru (Sorry - Arriva Cymru), viz. LR6, 14, 19, 22 and 26, now known as DOL106, 114, 119, 122, 126. In fact, DOL114 still had London & Country livery on the front of an otherwise all-over advertising scheme (MERCURY FM RADIO ACTIVE), and retained its LT-style garage code plate holders when seen at Aberystwyth in Summer 2000. All but DOL106 were based at Aberystwyth and I rode on 122 and observed 126 in service along the coastal route to Cardigan. The route is very scenic and very hilly, with superb sound-effects produced from the Leyland TL11 engines with which these vehicles are (rather unusually) fitted. I took it as an ill omen that they did not carry Arriva (cough, splutter) livery, implying that the investment was not justified. Sadly, they were all withdrawn from service in June 2001 for disposal. DOL106 survives in cut-down form (after losing its roof under a low bridge in Scotland) as a training vehicle and tours the depots. Another notable survivor is LR1, which lives on with Beeston's of Hadleigh, Suffolk after disposal by Arriva Herts and Essex. Crosville (and some successor companies) use a three letter type code for their vehicles. The quick-witted will soon deduce exactly what is signified by a DOG.